USD/JPYhas jumped towards the 102.70 level of resistance following the formation of a Piercing Line formation on the daily (see below). However, a pair of Doji candles denotes some deliberation amongst the bulls and suggests new longs are better served on a clearance of 102.70 which would likely open up the 103.50 mark. Drilling down to the four hour chart; there is evidence of a drawn-out struggle between the bulls and bears around the critical 102.50 intraday resistance level. While the Doji candlesticks signal indecision, a bearish reversal pattern would be required to support a bearish technical bias for USD/JPY. An actionable short Euro trade setupin line with our long-term fundamental outlook remains elusive after an expected move lower the US Dollar. The spotlight is on support in the 1.3779-1.38 area, marked by the 38.2% Fibonacci retracement and a rising channel bottom set from late January. We will look for a daily close below this boundary to confirm reversal and position for selling opportunities. 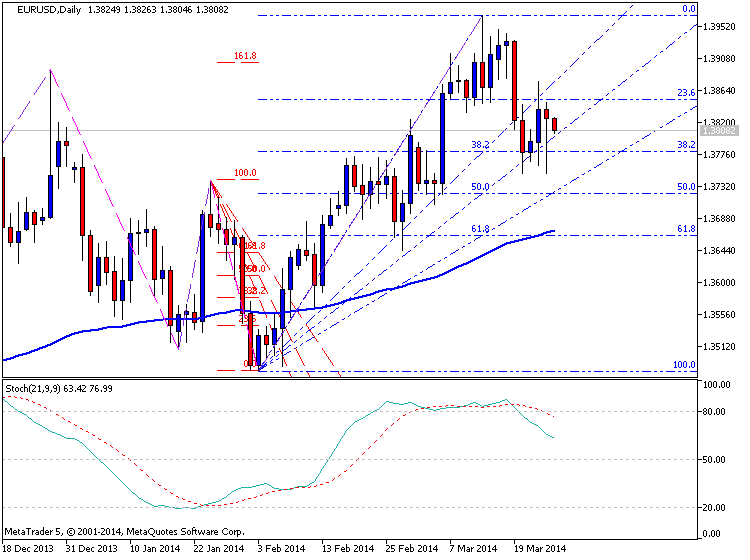 The break lower would initially expose the 50% level at 1.3721. Alternatively, a breach above the 23.6% Fib at 1.3850 would target recently broken rising trend line support-turned-resistance at 1.3876. The US Dollar advanced for a fifth consecutive day against the Japanese Yen having launched higher as expected after carving out a Triangle chart pattern. Prices are now testing resistance at 104.11, the 00.0% Fibonacci expansion. After staging an impressive decline the USD/JPY bears appear to be retreating following a failed attempt to push through support at 101.70. Traders will be on the lookout for a bullish reversal signal on the daily, with the four hour chart already hinting at a recovery for the pair. Drilling down to examine intraday price action; the four hour chart reveals the presence of a Hammer formation which is signaling a potential bounce for USD/JPY. This puts the resistance level at 102.70 back in focus in the session ahead. 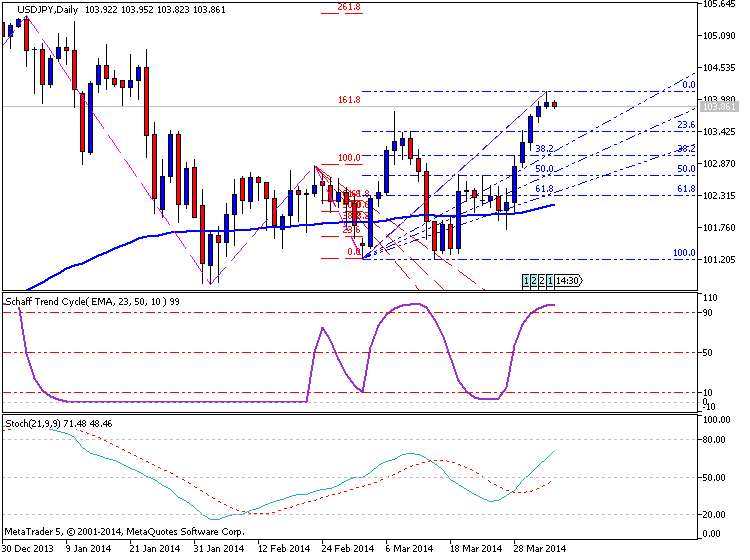 USD/JPY has resumed its descent as the bears once again take charge of price action. The absence of a bullish reversal signal on both the daily and four hour chart casts doubt over the potential for a recovery. Drilling down to examine intraday price action; the four hour chart reveals several Doji formations near the critical 102.00 handle, which signaled the potential for the USD/JPY recovery to stall. In the session ahead, buyer s may look to step in at prior support near 101.20. USD/JPY has recovered some ground in recent trading, although sellers appear to be capping gains for the pair near the 101.70 mark. The daily chart may be set to post an Inside Day pattern, which could hint at more significant bounce. However, the current candle has yet to close and receive confirmation. Drilling down to examine intraday price action; the four hour chart reveals a Hammer formation that has received confirmation. Further gains in intraday trade are likely to once again be met by selling pressure at 102.00. USD/JPY may be set tor break its narrow range between 102.00 and 102.70. The emergence of a Shooting Star formation suggests the bears are looking to firm their grip on prices. A daily close below 102.00 would be seen as an opportunity to enter short with a target offered by the next level of support at 101.20. Examining the four hour chart, the Bearish Engulfing pattern near 102.70 has resulted in extended declines for USD/JPY. However a Gravestone Doji suggests some hesitation from sellers near 102.00. This reinforces the need to wait for a daily close to demonstrate strong conviction from the bears. USD/JPY remains below the psychologically-significant 102.00 handle with the absence of a bullish reversal signal making a bounce look unlikely at this stage. Further declines may be met by buying support at the 101.20 mark. Examining the four hour chart; the Doji near 102.00 signaled a lack of conviction amongst the bulls near the key resistance level. With a bullish reversal pattern also absent in intraday trade, the potential for a bounce may be limited. EUR/USDhas plunged after failing to claim the psychologically-significant 1.4000 handle in recent trading. The intraday volatility has failed to yield a classic candlestick reversal pattern. However, the length of the upper wick and body of the daily candle suggests the bears are in control of prices. This opens up further declines towards the next noteworthy level of support at 1.3780. A Bearish Engulfing pattern near 1.3950 offered an intraday signal that declines were on the way for the Euro. While the Asian session has yielded a couple of Doji formations which hints at some hesitation from the bears, they are not enough to suggest a bounce at this stage. USD/JPY’s push past 102.00 following the Harami formation on the daily puts the next noteworthy resistance level at 102.70 on the cards. The absence of a bearish signal on the daily and four hour charts gives little indication of a potential intraday reversal. An examination of intraday price action on the chart below highlights the hesitation from the bulls near 102.00. 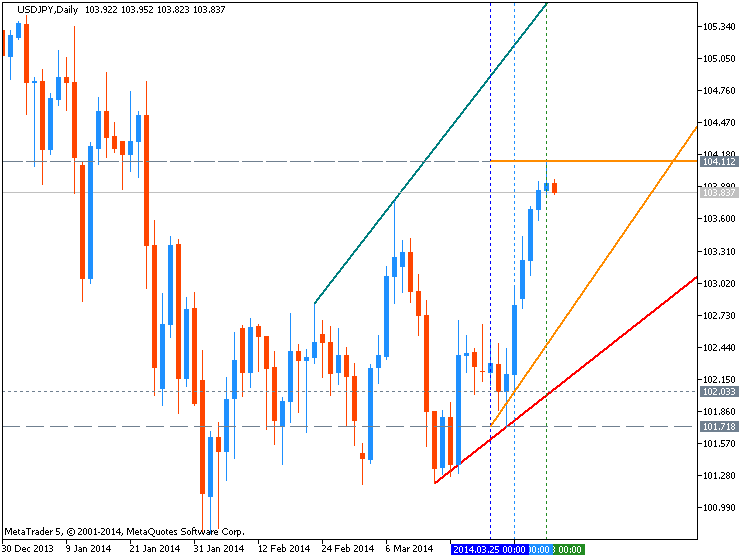 However following a push past the psychologically-significant level of resistance USD/JPY is eying the 102.70 mark.